Darjeeling: Days after BJP leader Mukul Roy had advocated Bimal Gurung's return to the Hills, posters appeared in Kurseong and Kalimpong on Friday morning daring Roy, Gurung and Roshan Giri to come to the Hills. Gorkha Janmukti Morcha leader Bimal Gurung had led an agitation in 2017 which had culminated in a 105-day long bandh in Darjeeling and Kalimpong. The agitation witnessed violence, deaths and arson with sporadic clashed between the agitators and security forces. Multiple criminal cases were slapped against Gurung and his men, including Roshan Giri and Prakash Gurung. They are all absconding since then. On Friday, posters written in Nepali and signed by "Janta" (public) appeared at different locations including motor stand and Park Location in Kurseong; Dambar Chowk and Motor Stand in Kalimpong. The posters challenged Mukul Roy to come to Darjeeling before urging Gurung and Giri to return. 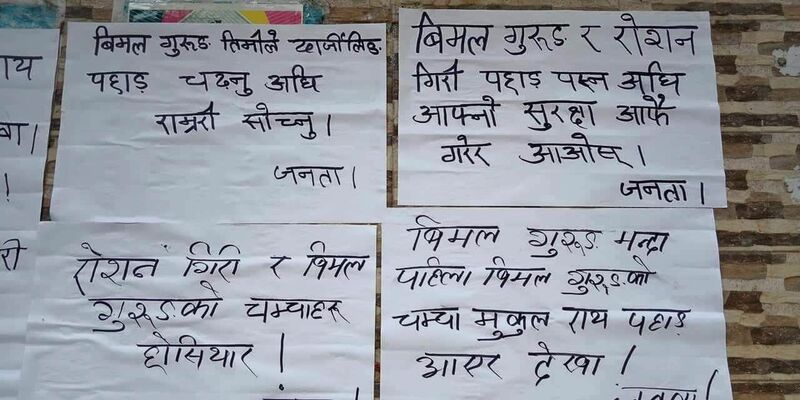 The posters dubbed Gurung Giri duo as Madan Tamang's murderers. "How many lives have Gurung ended in the Hills?" read the posters. "Faulty leadership has ruined the Hills. We do not want such leaders anymore. Let Gurung and Giri review their security before returning to the Hills," read the posters. Incidentally, the BJP had won the Parliamentary elections in 2009 and 2014 backed by the GJM in Darjeeling. In another development, the CID and the police on Friday carried out a court order of attachment of property of Prakash Gurung, a close confidant of Gurung. He has been charged under sections 353/12B/307/3012 of the Indian Penal Code in a case dated 17/10/17. Prakash Gurung has been declared an absconder. A total of 4 truck loads of goods was taken away from his residence at Barahatta under Lhodama police station in the Darjeeling sub division.